Former US House member David Stockman was Ronald Reagan’s first Director of the Office of Management and Budget (1981-1985). He was a key member of the team that developed the voodoo “supply side economics,” formerly known as “trickle down” economics. The idea of the supply-siders was that if you cut taxes on the rich, they’d all spend more and the economy would prosper. And if the economy prospered, why Republican voters would prosper, too. The supply-siders had no proof that the economy would prosper; the only thing that was certain about the idea was that the rich would pay lower taxes. Supply-side economics has always had the enthusiastic support of the wealthy. 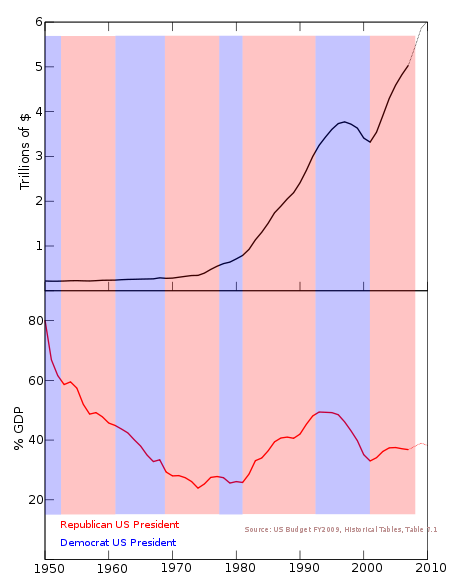 The top half shows the debt in trillions of dollars, not adjusted for inflation; the bottom chart shows the same data as a percentage of the then-current Gross Domestic Product (“GDP”). The steepest and greatest increase in debt by any measure was during Reagan’s two terms. As Stockman notes in his article, that was because Reagan greatly decreased taxes and, despite what you may have thought, also increased spending, particularly in defense. You have to ask why Republicans cling to this model. The second greatest increase came during George W. Bush’s administration, when two unfunded wars, an unwillingness to veto spending increases and yet more tax cuts created another spike in debt. The premise of the Republicans’ claim now that ending the tax breaks for the wealthy will hurt the economy has been proven false two times now. Each demonstration of falsity has cost the United States a few more trillion in national debt. Supply-side economics is voodoo. The premise is a lie. Stockman, who helped champion it in the first Reagan administration, has had the courage to admit it. Why can’t the noisy Republicans in Congress? The political bankruptcy of Republican fiscal policy is indisputable. The only question is whether the voters will fall for the Republican Big Lie. UPDATE: Paul Krugman had a nice essay on this issue on August 7. “Flim-flam Man,” indeed.